Al Fateh Al Hasa (SBL) signed 28-year old American guard Falando Jones (193-90kg-90, college: Mississippi Valley State). He is the second import player in the roster as Serbian Danilo Mitrovic signed here earlier. 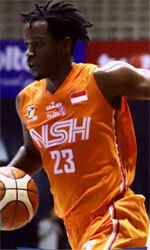 Jones played last summer at Hang Tuah in Indonesian IBL league. In 7 games he had very impressive stats: 25.7ppg, 6.1rpg, 1.1apg and 1.3spg in 2017 season. The list of the past achievements is quite long as among others Jones' team was regular season runner-up in Finnish 1st Division Division A in 2014. He was also voted Asia-Basket.com All-ASEAN League Honorable Mention back in 2014. Jones has played previously professionally also in Finland (Porvoon Tarmo). He attended Mississippi Valley State until 2012 and it will be his seventh season as a professional player.